The earliest and most detailed depiction of King Henry VIII’s famed Nonsuch Palace, a watercolour by the celebrated Flemish painter Joris Hoefnagel, has been recently acquired by the V&A. The painting, made in 1568, is the most faithful only six surviving images of the palace which was located in Cheam, Surrey. The fanciful building was commissioned by the king in 1538 and featured a facade decorated with elaborate plasterwork in Franco-Italianate style with the aim of rivalling the Fontainebleau residence of French King Francois I. One of the most important buildings of the English Renaissance period, it was unfinished when the king died in 1547 and was subsequently purchased from Queen Mary I by Henry Fitzalan, 12th Earl of Arundel, in 1557 – it was he who finished the building and most likely commissioned the Antwerp-born Hoefnagel to paint it. Later acquired by Queen Elizabeth I, it became one of her favourite residences and was eventually demolished by King Charles II’s mistress, the Duchess of Cleveland, between 1682 and 1688 to pay off gambling debts. Nonsuch Palace from the South, which is the first major work of Hoefnagel to enter the collection, can be seen in the museum’s British Galleries in South Kensington. Entry is free. For more, see www.vam.ac.uk. 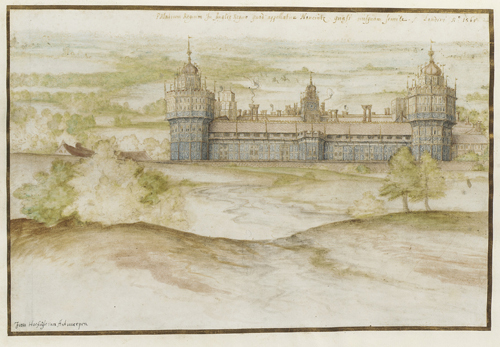 PICTURE: Nonsuch Palace from the South, Joris Hoefnagel, 1558, Watercolour © Victoria and Albert Museum, London.